I am just venting here, really. But I'm totally frustrated with Postcrossing right now. I love the quick mystery of sending a postcard to someone else, anyone, somewhere in the world - and love the surprise of pulling the received postcards out of my mailbox. ...but sometimes I get fed up. And I'm just feeling like sharing that right now. For a while I felt like being magnanimous, and I checked the box in my profile that said "I prefer to send to repeat countries" or something like that, to offset the huuuuge numbers of people signing up from a certain unnamed very huuuuge country. But my postcards to that country either take forever to arrive or inevitably expire. Honestly, I just dread seeing that unnamed country come up on an address, because it means I am sending a postcard out into the void and it's unlikely ever to arrive. Also, a neighboring huge country - Russia. I have had postcards arrive to and from Russia, but something is going on over there lately that is waaaay slowing down mail delivery there (though I receive postcards from Russia in about 2 weeks lately). Due to the number of postcards I've sent through postcrossing, I'm allowed to have 10 traveling at any one time. I've got 2 traveling to Russia right now - one for 34 days and one for 39, one to the huuuuge unnamed country (had 2, but the second one expired) for 35 days... and here is the frustrating part much closer to home. I've got one traveling to Canada - our neighbor to the north - for 21 days! That user hasn't logged in for 20 days, though, so I'm betting it's arrived and they just haven't registered it. And another to the USA, still here on the Eastern seaboard, that's taken 14 days! And then I remind myself how many awesome postcards I've received and wonderful people I've connected with via Postcrossing... and I get happy when I see an address in Finland or Germany or the Netherlands, because those always arrive (and get registered!) right quick. And in the spirit of balance, I'll mention that I sent my first postcard to Switzerland recently, and it arrived in FOUR DAYS. I can't even get a card to my family in the midwestern USA that quickly! Anyone have any other Postcrossing stories to share? I feel like I have my ups and downs with postcrosing all the time. I love sending off postcards but the amount I have had expire on me, I cant help but wonder if I am wasting my time and money? I dont know if the problem is the postal system or people just dont register. Either way I will stick with it because I do really enjoy it. I have to say ditto to your comment regarding that huge, unnamed country. It takes forever for postcards I send there to be registered & the only expired cards I have were sent there. It's a bit discouraging. I also checked that box to send to repeat countries ... and recently unchecked it, for the reason you mention ... the larger numbers of participants in large countries, the more chance you have of getting someone who signs up in a moment of passion and promptly forgets about the site the next day. I would like to be magnanimous, too, but I also have to consider my postage budget. I am number three in the US for number of cards sent ... so I have 38 cards traveling at once. Even though I do send and receive from the US, the great majority of my cards are international. It works out to $35 invested in postage alone. I want to do everything possible to make sure my investment reaps the reward of getting registered. I've been on PostCrossing since its beginning (I am Zmrzlina there ... I used to have six profiles, but that was back when you could never have more than 5 cards traveling at once ... I only used Zmrzlina now, and every once in a while I resurrect PostMuse) and I've met many wonderful people ... too many to link ... and received many wonderful postcards. I have also had many, many cards expire. At the moment I have 16 expired cards. After one year the expired cards disappear from your list and that's what I don't keep track of anymore. I always wish I could just chose to hide the expired cards so they don't taunt me. I am getting better at accepting expired and long traveling cards. I really am. It used to make me very angry and I'd send PMs to people begging them to registered my cards, but I just let it go now. I guess with so many cards traveling, and coming to my mailbox, it makes it that much easier to let go. I have much the same problems, especially recently. I have just over half my 16 travelling going to either Russia or the vast unnamed country. The Russian ones do eventually get there, mostly, but it may be fewer than 50% of the others. My heart always sinks when I have one of those addresses. At the moment though, EVERYTHING has been delayed. PS Never give up hope though! I had one card registered after 199 days and that was to Belgium from the south of England. I could have walked there faster. And one arrived from Australia with the appropriate postmark, correct address and postage, after 134 days. I hope they get there soon! On a royal mail note, we're always complaining about how rubbish the post is in the UK, but I sent a package internally, in the afternoon no less, and it arrived there the NEXT DAY! Royal Mail, I salute you!! Yep I got one from russia over christmas that took almost a month from the time the person sent it . a month !!! wow pretty fast from russia . Ah, I'm glad it's not just me... I wonder if Postcrossing keeps stats on expired postcards from any particular country, and how many will have to expire for one country before it's re-examined. I know we can't be prejudiced, and I often wonder if it is that country's mail service as much as the people not registering them... but it's frustrating from our end. Mischief, the box to check or uncheck is in your profile settings. My current Postcrossing woe is a card to Lithuania that's been traveling over 40 days. But even more seriously, I recommended Postcrossing to a friend and her experience has been very different from mine. Her cards take longer to arrive and be registered and the ones she receives are not nearly the quality that I have received. First off, I had to look up the word "magnanimous"! I thought I was in Russia/huuuge country purgatory recently, but 5 out of the last 6 names drawn have been to USA. And another US card to SD has been traveling 32 days, so far. One recent recipient in huuuge country listed his mailing info in native language also, he said the card would arrive faster if addressed in that particular way. I printed and taped it on the card. It was registered 24 days later. Oh! And I had a huuuge country card registered after 124 days, but that was my own fault. It was discovered that I had transposed 2 numbers in the ID number. I'm about to request 2 new names, so I'm hoping that posting here first did not give me bad Postcrossing mojo! Having venting a bit myself yesterday, today I got a card from Kazakhstan and pulled an address to send to Suriname. That's about the most exotic day I've ever had on PostCrossing! I have had the same observation, and also dread seeing the Void pop up as my next card. I currently have four en route to the Void (the oldest 44 days), and two to Russia. I have found, however, that if one addresses cards to Russia in Cyrillic, it cuts the delivery time dramatically, especially when the card is headed to one of the provinces vice Moscow or Saint Petersburg. My Cyrillic handwriting has gotten really good, and it's really helped me with the Russian alphabet, which has always given me trouble. Postal delivery time is absolutely fascinating. I think a "grad" student, somewhere out there in the abyss, should do an intensive study of it. Great topic! 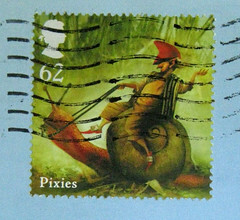 I enjoyed reading about PostMuse's Postcrossing adventures. I concur with the other comments about the two gigantic countries with the horribly slow mail service. At first I was disappointed with the expired postcards but found out that they can indeed be registered when received even if they say "expired." I usually send an additional card to the recipient and tell them to watch for it because it's card #2 and the second card somehow gets delivered to them. It's been a fun hobby and a couple of people overseas are now pen friends as a result. On my next postcard to send to Russia, I'm going to try freetranslation.com and type the name/address into the translator in English and then it will translate into Russian (Cyrillic). Then I will print it out, and list the address both ways (English and Cyrillic) on the postcard so maybe it will leave the USA as expected and then get delivered quicker on the other end in Russia...? Just an idea. I could let you know if this works. The Cyrillic definitely works; usually the only English I put in the address is "Russian Federation" in the last line. I just had a card arrive in Siberia yesterday after only 30 days. hi ilona! i just quickly scanned your blog. sorry about the delay in registering...i had some things going on. i hope to get back into the swing of postcrossing. Plus! All of my postcards going to the country I complained about are going to users who haven't signed on in over a month :( Great sadness! China. The original post on which you're commenting was one from 7 years ago, and the issue has (mostly) worked itself out. I contacted Postcrossing about this and they were very friendly and professional about explaining how the numbers worked, and if you are sending a lot of postcards at once - as I am - you end up getting assigned the most heavily participating countries most frequently. So, I will always have a lot of postcards traveling to Russia, China, the USA, and Germany. They arrive well and quickly to the USA and Germany, and take a lot longer and more often get lost to Russia and especially to China... but *most* of them do actually arrive, eventually, within a couple of months. Yes, a higher percentage do go missing or expired, but that's just par for the course for sending a lot of postcards. And of course it's not the people of China or Russia's fault that their postal service is on the slow side!